Two years ago, my experience with the northern part of Phuket was limited to a taxi drive from the airport to Phuket Town. Now, with the aid of a motorbike, I finally got to see more of this part of the island. 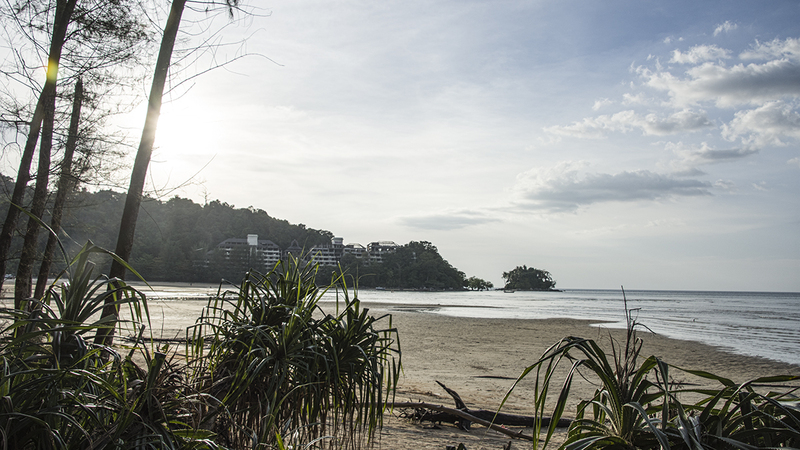 I didn’t know there were two beaches, Nai Yang and Mai Khao Beach that together stretch more than 9 kilometers up the west coast of the island. With that much beachfront it isn’t too hard to find a remote spot to be alone with nature. Abandoned hotel at Nai Yang Beach. You will find these two beaches encompassed inside Sirinat National Park, which is about 90 square kilometers in size. 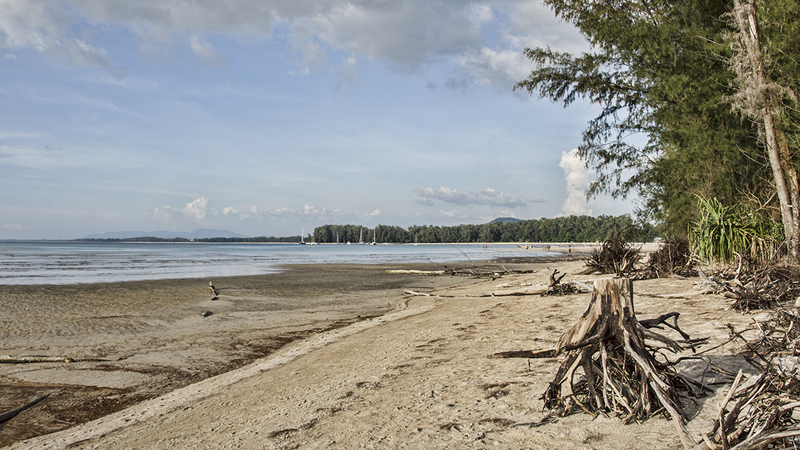 The park also includes two additional beaches, which I didn’t get a chance to visit, Nai Thon and Sai Kaeo. In addition to beautiful white sand beaches, you can find many species of trees to provide respite from the sun, including ironwood, tulip trees, and ashoka trees, to name a few. I really loved this national park, and am looking forward to visiting it again when I travel back to Phuket one day. From November to February one might also find sea turtles laying eggs on these beaches, too! 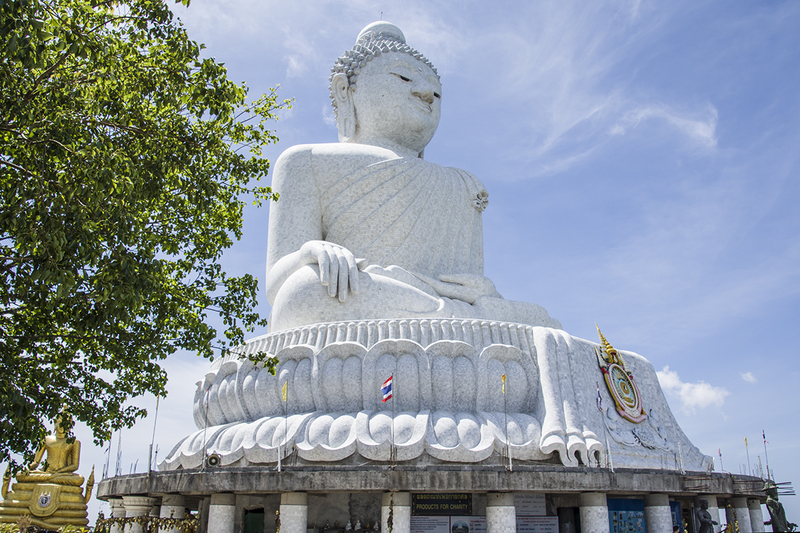 Phuket’s BIG Buddha is REALLY BIG! After taking several days to see most of the beaches on the west side of the island, it was time to take in some other sites. One of my favorite places when I was here the last time was the Big Buddha, or Giant Buddha as known by the locals. I was extremely excited to make the trek up there this time on my own with my 125cc motorbike. I remember going up the long and winding road, not the Beatles song, but the road up the mountain to the 45 meter tall, white marble statue of the Buddha. It is a 6 kilometer long winding road that provides spectacular views of the bays and towns on the southern part of the island, and is well worth the drive based on those views alone. Once at the top, one is not disappointed! This is a two thumbs up site to see, and is most definitely one of the main tourist attractions on the island. I highly recommend this as a must see tour stop if visiting Phuket. Wat Chalong is the largest temple complex on the island. 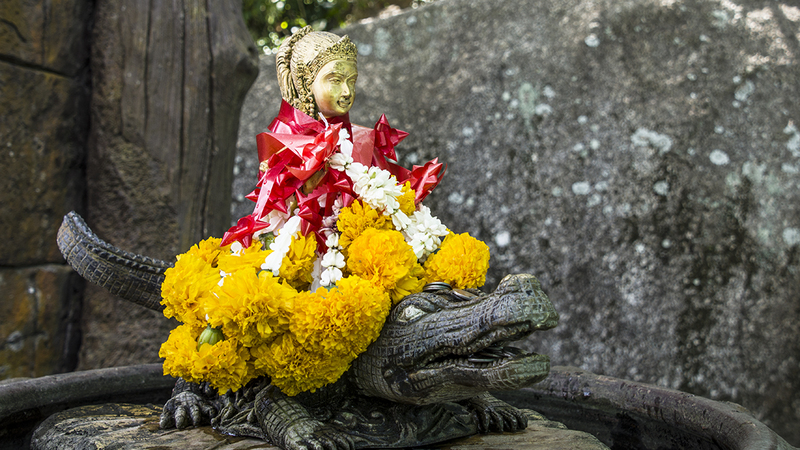 The next temple I would visit is the most revered temple on the island, Wat Chalong. The temple complex was constructed on its current site back in 1837, and you can read more about its history in the link I have provided. It is a fairly large complex, with several smaller temples situated around the main temple or chedi in the complex. 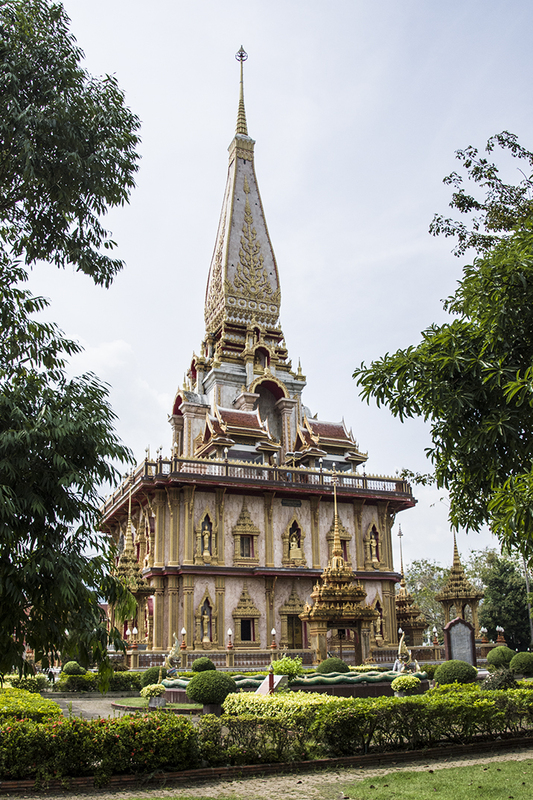 The chedi at Wat Chalong is said to house a bone fragment from the Buddha, himself. The temple has a long history of monks and abbots displaying their healing powers through various ways, one using a walking stick to heal people, and two others using their knowledge of special herbs for healing purposes. People come from all over the island to pay their respect to Buddha and the monks that served the people in their time of need. There are also many gold figures of the Buddha throughout the three story high chedi. I was completely in awe of the beauty inside this temple, and this is another temple that would get two thumbs up from me. The grounds engulfing the complex are extremely beautiful too, and well worth a walk around. The complex is a short drive from Phuket Town, with many places to stop and grab a bite to eat along the way. 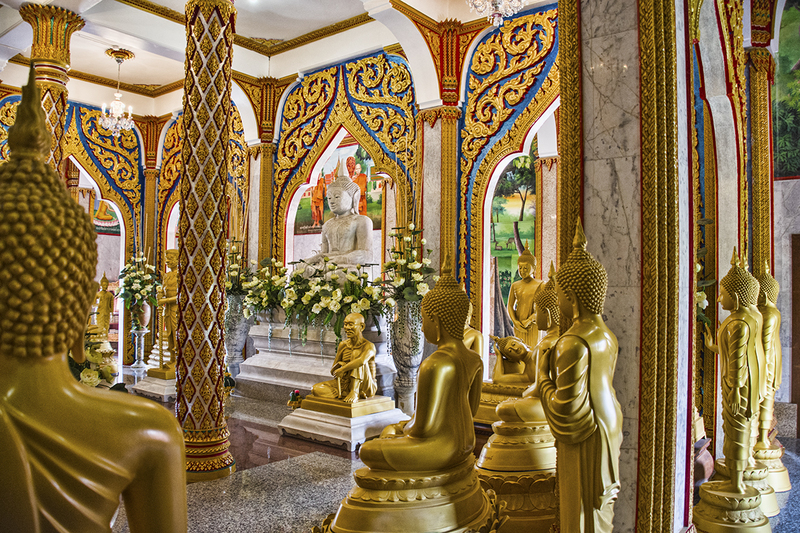 Inside the beautiful Chalong Temple on the island of Phuket. 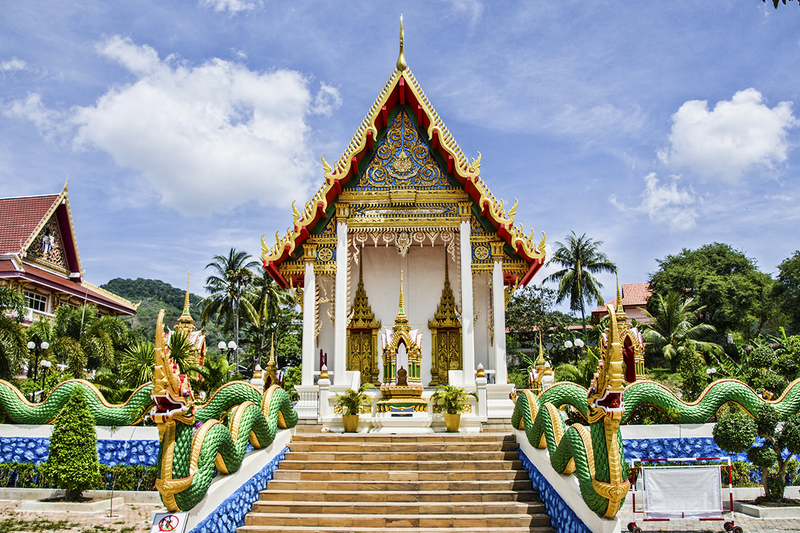 Phuket has many temples on the island, and these are just two of my favorites. There are 29 temples to see, all of them unique in their own way, and worthy of a visit. If you have been following my blog posts, you know that I have posted photos of two others, one on my post about Nai Harn, and another photo of the one under construction at Surin Beach. I visited one other temple on a quick trip through Karon one day, and had a wonderful interaction with a woman and a young boy, none of us speaking a common language, when they helped me get a lens cap out of a drain where my hands couldn’t fit through the grate. I will always treasure that moment, when they went out of their way to help me. Wat Suwankiriket in the town of Karon. Phuket, I had learned, wasn’t just an island full of beautiful beaches, it had so much more to offer! So many amazing, interesting Buddhist temples, with such intricate artwork, each one a bit different than the other. Each one, worthy of a visit. Each one in their own way, talking to me, calming me, with the presence of the Buddha. Buddha was once quoted as saying, “Better than one hundred years lived lazily and lacking in effort, is one day lived with vigor and exertion.” I think we should all live like this, live with purpose, with passion, with vigor, exerting our light that guides us, and not take each day for granted. I hope I can motivate even just one person that reads my blogs to do that, carpe diem, seize the day, live life to the fullest and travel the world, meet new people, see new cultures, and I can almost guarantee it will be a life changing experience for anyone that takes me up on that challenge! In closing, I hope to see everyone in two weeks, when I write about more of my adventures in southeast Asia, best wishes to all of you, peace out! “Whatever an enemy may do to an enemy, or haters, one to another, far worse is the harm from one’s own wrongly directed mind,” Buddha/The Mind. As my website says, I am into travel and photography, in either order! I am all about adventure, too. U-Baan Hostel is so AWESOME! Remember me from EC? You’ve become quite a good writer, I always enjoy your blogs, and I’m glad you found something beyond the construction field. Thanks, John, I really appreciate the feedback, I am so happy you enjoy my posts! It’s great to get some feedback, and it definitely gives me more motivation to continue. Again, I REALLY appreciate your kind words about my stories! I will be posting some video and a LOT more photos to my photo gallery. I am just finishing up a work station with a new IPS monitor for more quality editing and have a lot of video to go through on this last trip. I hope you enjoy my future posts, photos, and video! Ah, thanks for the kind words as always, Leah! I hope I have motivated one or two people, haha. I know the feeling, I miss meeting all the fellow travelers, and especially miss hanging out with you, I hope next time I am on the road we can meet up, and maybe if we are lucky enough, we can catch up to Christine, too! I am also vicariously traveling through my blogs again, too, lol. Thanks again for your comments, it means a LOT to me!!! JayDTravel/Photography © 2019. All Rights Reserved.